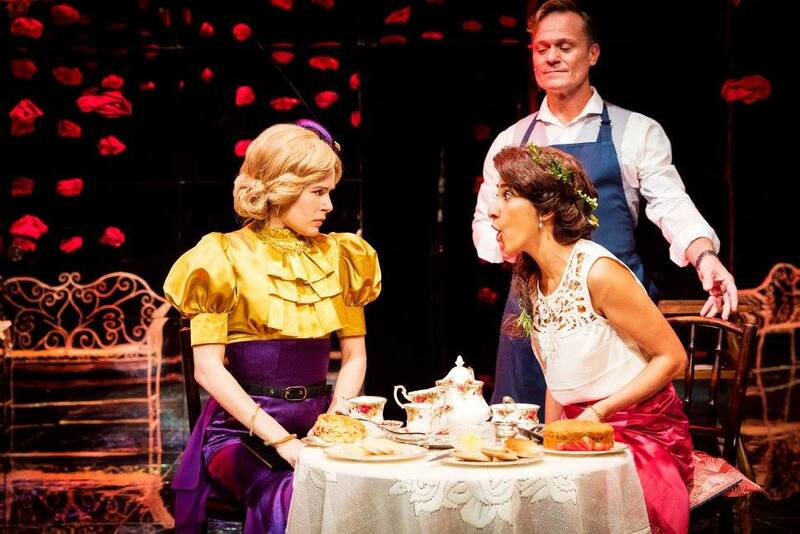 The reputable Oscar Wilde play The Importance Of Being Earnest is revived in a fresh and contemporary production, the Birmingham Rep and Leicester Curve have given the play an innovative update that maintains the classic comedic dialogue. It is the well-known story of two brothers who create alter egos of themselves in order to escape from their monotonous lives.Through mistaken identity, they manage to land themselves in trouble and go to great lengths in order to get out of it. With the stage completely decked out in mirror, reflecting the vanity and superficial nature of the characters. Designer Isla Shaw has reimagined the performance with a modern yet surreal vibe, with staging that makes the audience feel disoriented, the illusion gives the idea of there being no infinite ending to the stage, and therefore the performance barriers are left to the unknown. The use of techno music during scene transitions give the production a futuristic vibe, which is echoed in the lavish costumes. Despite the character’s outfits resembling that of the classic era, they are created with bright metallic material. 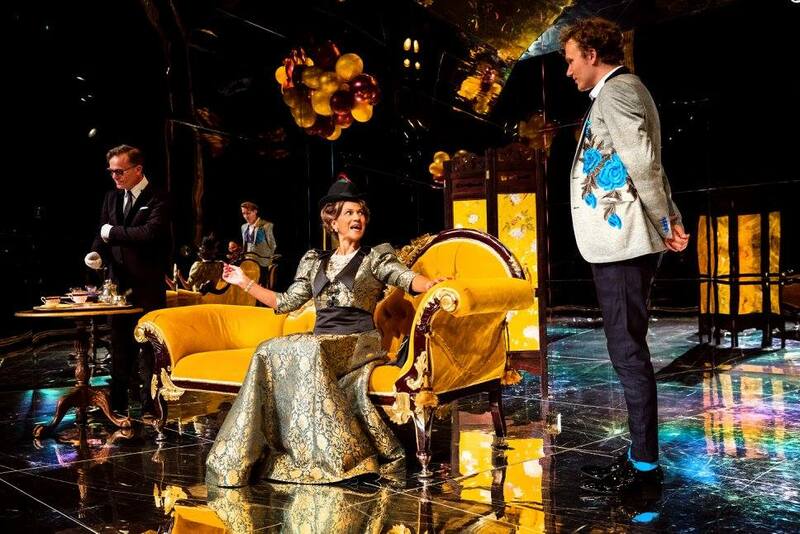 Wilde’s play explores the theme of social class, and opening the show the two young gentleman John (Fela Lufadeju) and Algernon (Edward Franklin) appear as spoilt young rich kids. Their youthful arrogance mirrors the characteristics of those on reality tv show Made In Chelsea – adding to the stylish setting of the piece. Both Franklin and Lufadefu have a superb chemistry, as their frustration towards each other is excellently funny and highly engaging, their dialogue sets the pace of the production. Whilst the first half is slightly slow, the wit in the second act is heightened, displaying the comedic excellence of Oscar Wilde’s writing. Young ladies Gwendolyn (Martha Mackintosh) and Cecily Cardrew (Sharon Phull) have sensational on-stage chemistry. They are slick with the delivery of their lines, and clasp the comedic timing sublimely. This is also evident in Cathy Tyson’s portrayal of Lady Bracknell who conveys the sternly obnoxious role with an assertive tone and naturally masters the iconic handbag line. However, it is the melodramatic passionate romance that is sparked between Cecily and Algernon which gives the performance punch. Their eccentric personalities combine to create a match that is charged with flamboyancy. It’s a difficult show to revive in terms of over complicating the storyline with adaptations, however director Nikolai Foster has nailed it with a clean and simple, yet technical revival. On at the Birmingham Rep until the 24th of September, tickets can be found here. I thoroughly enjoyed the play. I have never seen it before so I have nothing to compare it to but it was fun and made me laugh.